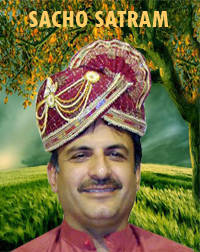 Bhagat Kanwar Ram Sahib is the name which is very closely related to Sindh and Sindhis. He was a Holy man, a messenger of God who would sing in his sweet, melodious voice in the praise of his Creator. He was born in the month of April with the blessings of Saint Khottaram Sahib. Bhagat Kanwar Ram Sahib’s mother was a simple, loving and humble lady. Her name was Thirath bai she was fortunate to have children after she got blessings from Saint Khottaram Sahib, who was an infinite ocean of mercy. Once while she was doing Seva by filling water in the pots at Raharki Sahib, Sai Khottaram Sahib very lovingly asked her if she had any unfulfilled desires which she wanted to fulfil. Tirath bai told Saijan about her deep desire for having her own child. Saint Khotaram Sahib said that God will definitely fulfil her wish. Next year with the blessings of Sai Khottaram Sahib a wonderful miracle happened and Bhagat Kanwar Ram Sahib was born to Tirath bai. It was a wonderful day, 13th of April. 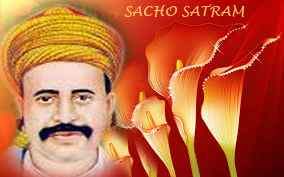 It is a well known fact that Bhagat Kanwar Ram Sahib made Sindh and Sindhis proud of themselves in the whole world. He had a sweet soothing voice. 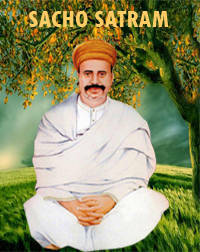 It is said when Bhagat Kanwar Ram Sahib sang people would forget about everything. They would leave all their work and paid attention to his mytical voice. 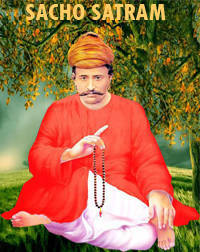 People loved and worshipped Sant Kanwarram Sahib , as he was man of God. He was the pride for his parents and the whole world, and earned tremendous respect and popularity with the blessings of Saint Satramdas sahib.